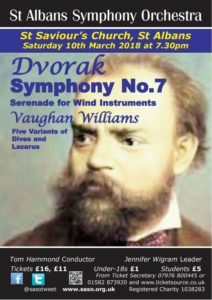 Two favourite composers whose music displays a deep love of their respective countries’ folkloric traditions will feature in St Albans Symphony Orchestra’s concert on Saturday March 10 (7.30pm, St Saviour’s Church, AL1 4DF). Ralph Vaughan Williams made a significant contribution in his early career to the collection and preservation of English folk music; and his Five Variants of Dives and Lazarus is based on a traditional ballad that he especially loved. The variations, which are scored for strings and harp, will appeal to anyone that enjoys the composer’s more familiar works, such as The Lark Ascending. The spotlight will also fall on SASO’s woodwind sections and horns for a performance of the tuneful Serenade for Wind Instruments by the Czech composer Antonin Dvorak (who also included a ‘cello and double bass to reinforce the bass line.) The Serenade inhabits the same colourful world as the composer’s Slavonic Dances, including an example of the traditional Czech ‘Furiant’. Working with their Principal Conductor, Tom Hammond, the whole orchestra, including brass, will come together for the second half of the concert to play Dvorak’s Symphony No. 7. Although blessed with all the melodic invention for which the composer is famous, the work embraces elements of melancholy and seriousness to a greater extent than any of his other, mature symphonies. Tickets, priced £16 and £11 (Under 18s £1, Students £5) are available from the SASO ticket secretary (07976 800445), tickets@saso.org.uk or online from www.ticketsource.co.uk (booking fee applies).